Concern about the health of Boston Symphony’s Music Director James Levine preceded both the BSO Gala Opening Night on Saturday, October 2, and his return five days earlier to the Metropolitan Opera for a much-anticipated production of Wagner’s Das Rheingold. At both performances, Mr. Levine was greeted by the audience with a hero’s welcome. 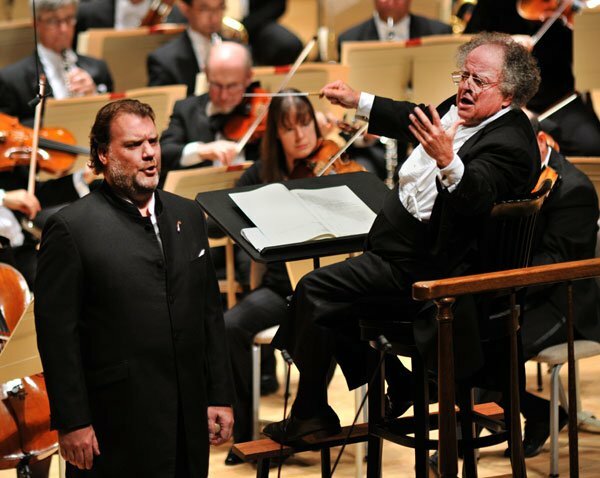 His fellow hero on stage at both the Met and the BSO was the great and much-loved Welsh bass-baritone Bryn Terfel, who shared and earned standing ovations for all four pieces he sang. At both performances Mr. Levine was greeted by the audiences with a hero’s welcome. At Symphony Hall, a rather slimmer Mr. Levine walked carefully, unaided, onstage onto his podium, where he planted himself on his custom-made swivel chair for the duration of the concert. Sitting, he conducted energetically, with much larger hand and arm gestures than before his last grueling back surgery; he gratefully accepted the audience’s enthusiastic applause and repeated standing ovations. Rather than go offstage between pieces, Mr. Levine continued to sit, but no matter: the orchestra played wonderfully for him, and the audience, including many important BSO givers, was simply thrilled to have him back in the hall. The BSO audience was a polite one; they seem to take galas in their stride, wearing nice clothes, but nothing too flashy, not much jewelry. Last night at Symphony Hall was a glitz-free zone; one would never confuse this audience with an Opening Night crowd at the Met or the Philharmonic. As part of the new Met production of Wagner’s “Ring” cycle, Mr. Terfel will be singing Wotan, the head god, husband of Fricka, father of innumerable children (though none by Fricka) including Brünhilde and her eight Valkyrie sisters, known best for their battle cry “Ho-jo-to-jo” and helmets with two hornlike protrusions. (At the Chicago Lyric Operas’s production of the Ring five years ago, plastic Valkyrie helmets were all the rage. By the third opera much of the audience arrived wearing them). This BSO program opened with a exciting, beautifully paced and played Prelude to Act I of Die Meistersinger von Nürnberg, written, along with Tristan and Isolde, when Wagner took a long break from writing the “Ring.” Wagner’s overtures accomplish musically —in less than fifteen minutes — the essential content of a six-hour opera. After the Meistersinger Overture, Bryn Terfel strode on the stage in a long back jacket and sang Hans Sachs’s Act II Monologue, which he had sung at Tanglewood in 2004. Mr. Terfel showed a much softer self in “Wotan’s Farewell,” mixing heartbreak and regret. This aria was preceded by the inimitable “Ride of the Valkyries from Die Walküre, the second of the four “Ring” operas. The BSO played it brilliantly, but for those accustomed to hearing it with the actual Valkyries singing at crucial moments, it felt like music minus one, or eight to be precise. The Magic Fire Music which followed Wotan’s Farewell was played gorgeously. The four harpists who had tried valiantly to be heard through the orchestra in the Meistersinger Overture enchanted here. Throughout the evening the winds — especially the English horn in The Flying Dutchman Overture — and the low brass deserve special praise. The printed program closed with the Dutchman’s Monologue (“Die Frist ist um”) from The Flying Dutchman, which let the audience see the Dutchman’s bitterly frustrated side. Terfel’s perfect enunciation and pitch, sense of drama, and heartbreaking high notes dramatically limned the Dutchman’s agony of having to roam the seas, never to find redemption. Mr. Terfel’s Wotan’s Farewell” is one of the Ring’s most emotionally wrenching moments. Wotan he is saying goodbye to his most beloved daughter Brünhilde before leaving her asleep on a rock surrounded by a magic fire. Mr. Terfel captured each of Wotan’s shifting emotions, his voice initially full of pathos and tenderness, then soaring with ease over the orchestra with breathtaking power and beauty. The audience, which gave Mr. Terfel another standing ovation, was rewarded with an unforgettable performance of Wagner’s “Evening Star,” accompanied mostly by BSO’s own new star, harpist Jessica Zhou. At this point in his career, Mr. Terfel can sing whatever, whenever, and with whomever he wants. The warm rapport he has with Mr. Levine was palpable. Mr. Terfel has recently attracted roles to suit his dark, brooding qualities. (He was the most poisonously pernicious Scarpia I can recall.) Last year a Bryn Terfel CD was released with the great title “Bad Boys” featuring him as Mack the Knife, Mefistofele, Sportin’ Life from Porgy and Bess, Don Giovanni, and Sweeney Todd. Most music lovers would be happy to hear this incomparable singer do Good Guys or Bad Boys, classical or Broadway. He’s got the voice and personality for all of them.